With a bunch of cats for pet, you also need the best clumping cat litter to control the odor control and to prevent cats from stinking around your rooms. For a cat lover it is important to understand that one of the difficulties of keeping a pet cat is to clean it up after it. Following are the detailed reviews for 3 best Cat Litter. 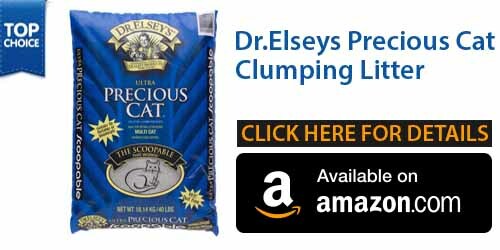 Dr. Elsey’s is a most popular clumping cat litter used for order control. It is for those who prefer the non-scented cat litter. Primarily Dr. Elsey’s is a 99.9 percent dust free litter so there isn’t any chances of dust collection and therefore less mess. It is also a hypo- allergenic and therefore it doesn’t have any perfumes, deodorants and plant proteins in it. It is entirely natural and performs best to prevent the bottom of litter box from moisture. The best part about Dr. Elsey’s is that it has the best odor control as compared to any other clumping cat litters out there. It also works best against feces as well as absorbing urine. Whereas other cat litter brands break apart soon when you try to scoop the litter from the box. In contrast Dr. Elsey’s litter creates a solid clump to avoid break ups. It absorbs urine perfectly therefore it needs less clumping litter as compared to the other brands. The reason why this brand is kept odorless is because studies have found that cats like odorless litter more. Although most if not all cat lovers like an air freshening litter in their rooms, Dr. Elsey’s is more cat friendly. This type of cat litter works best to control odor therefore you do not need such scented litter to hide the smell. One drawback of this litter is that it isn’t flushable; therefore you need to throw the clumps in the garbage. Remember that flushable cat litters will require to be dissolved in toilet. This means they must have an ability to be dissolved inside the litter box. 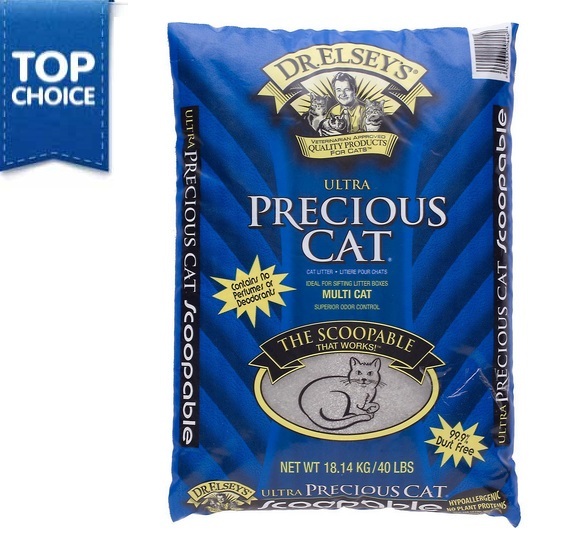 Overall Dr. Elsey’s cat litter is one of the best brand for odor control if you prefer an odorless litter that also perform well to control the odor. For those who prefer a cat litter that is 100 percent natural, World’s Best Cat Litter is the best option of clumping cat litter. It is a biodegradable litter made from whole kernel corn that makes it both cat friendly and environment friendly at the same time. This makes you capable to safely flush the cat litter in the toilet and if you are lazy enough to deal with those garbage bags. There aren’t any silica, clays, , or synthetic materials used in this type of cat litter, therefore you do not need to worry about your cat ingesting such stuff that are harmful for your cat. The top secret formula used in this litter is designed in a manner that it doesn’t stick to the body or paws of your cat. Therefore when cat licks itself it doesn’t accidentally swallow such harmful stuff. Moreover, World’s Best litter doesn’t collect any dust and keep the litter box area clean and free from germs. The texture of granules is really quite nice and cats respond best to it. When it comes to odor control, this brand is perfect at controlling all types of odor that come out of the cat box. Regardless of the fact that Dr. Elsey’s brand is considered to works best in this area, World’s Best isn’t bad. For someone who is completely concerned for neutralizing the odor, he or she probably choose Dr. Elsey’s brand. However to consider the complete package, World’s Best is certainly a best option. The reason is that it is made from whole corn, which makes it completely edible and flushable, to provide a supreme convenience for you and your cat as well. Cats are more likely to play around and therefore it can simply ingest the scraps of the litter. In addition, the ability to scooping out litter and dumping it down the toilet is another bigger convenience. 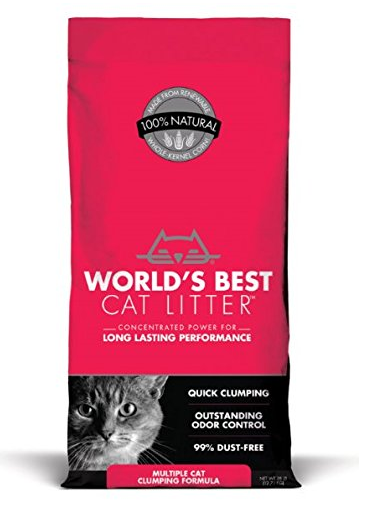 On the whole, for someone who is looking for the best corn based clumping cat litter that is flushable and edible, then World’s Best Cat Litter is the best choice. If you want an unscented fast clumping cat litter, which is flushable too then Nature’s Miracle is the best choice. It is also best for odor controlling. It is designed for high traffic homes with too many cats because it absorbs both solids and liquids easily as well as clumps very quickly. When it is about absorption we consider Nature’s Miracle is the best of all. Nature’s Miracle is clay based formula that instantly absorbs urine and instantly clumps the feces on the top most layers of the litter box, so that it does not get wet or soggy. It creates a solid clumps therefore it do not break easily at the time you scoop it up so there aren’t any worries of leaving a mess in the litter box as well as all over your floor. This capability also saves the cat litter. Indeed a bag of Nature’s Miracle cat litter last as longer than two bags of any other generic non-clumping litter. 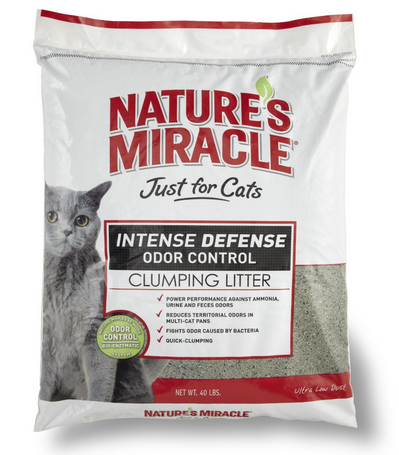 Nature’s Miracle litter is cat friendly because it is an unscented cat litter. Although a scented type is much better for your room when it comes to overall smell, cats like the unscented ones. On the other hand, a bio-enzymatic system used in Nature’s Miracle cat litters, it is a good way to control the odor caused because of bacteria. Even though it isn’t as good as Dr. Elsey’s when it comes to odor controlling feature, it yet perform well and is a second best option. We believe that it is able to clumps faster with an exceptionally high absorbency level. Moreover, as a plus point it is flushable without worries of about clogging up the toilet and harming the environment. In general, Nature’s Miracle is the best clumping cat litter for those who want an unscented litter that also have high absorbency. 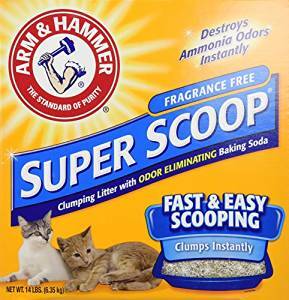 If you are looking for the perfect litter for your cat, then you can take a look at Arm and hammer super scoop clumping litter, fragrance free. This cat litter has a lot of advantage and you will find it very easy to use for your cat. This litter comes with highly absorbent corn fibers that are able to absorb twice the odor that is caused by the cat urine. This is also beneficial if there is no open space, then odor can be a huge problem and this cat litter can tackle with it effectively. The hard clumps of the cat litter will lock in the odor and will also prevent any crumpling. If it crumples, it can mess up the floor space where the cat litter is placed and as it can deal with the odor, the indoor will remain fresh. As soon as your cat uses this cat litter for excreting, as soon as the cat litter comes in contact with the excretion, it will release the lock in odor. Also it is fragrance free as most cats are not comfortable using fragranced litter and will not consider using it. 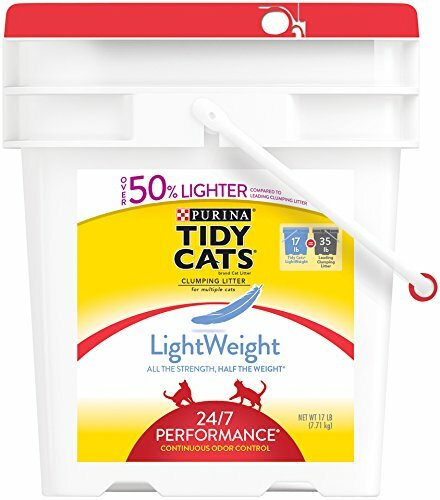 If you are looking for the ideal cat litter, then you should definitely consider purchasing Purina tidy cat’s lightweight 24/7 performance clumping cat litter. This cat litter comes with a lot of advantage if you decide to use it for your cat. This cat litter will provide with continuous odor control and this will keep your home free of any odor. Odor can be a huge problem if your area is closed and not open and odor control will rescue you from this huge problem and offer your home with an instant freshness and it will be very easy to clean the cat litter because there will not be any odor that will make it hard for you to clean it properly. And if there is odor, then your cat may not use the cat litter. Also this cat litter will provide you with powerful absorbent. 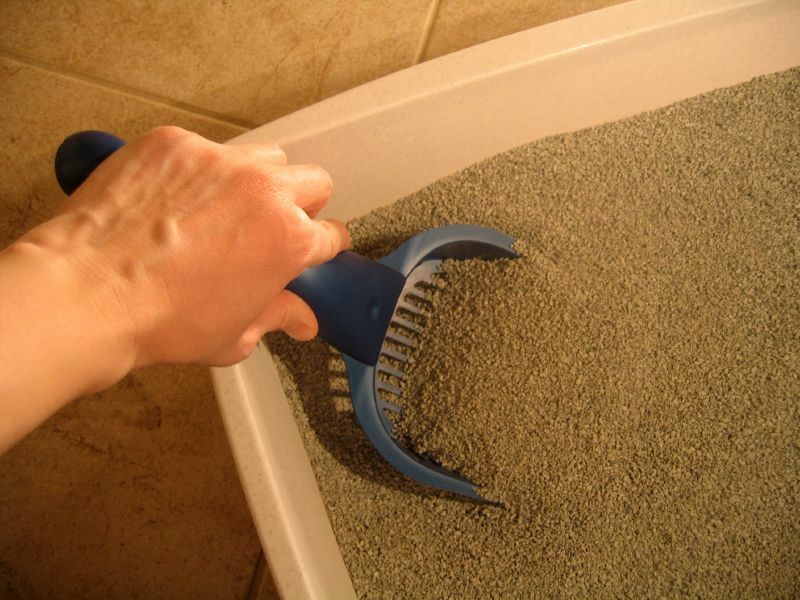 It is 99% dust free and is light and offers tight clump for easy scooping of the cat excretion. It is very easy to switch the cat litter because of the light weight of the cat litter. Easy clumping means that there will not be any mess when cleaning the cat litter. What should you check when purchasing cat litter? You should take a look at whether the cat litters is equipped with an odor control. If there is no odor control then it can be a huge problem while cleaning the cat litter and the cat may not use the cat litter in future for use. You should avoid any cat litter that has fragrant. Most of the cats don’t prefer cat litter that is fragrant and rather they prefer non fragrant which is more natural to them for use. Make sure that the cat litter can clump effectively and it comes with effective absorption as it can then absorb the cat excretion or urine effectively and clump them for an easy cleaning.